It been a while since the announcements of our intent to open source App Inventor and the creation of the MIT Center for Mobile Learning to support and extend the open sourced App Inventor code. On the development side, we’ve been quite busy working to port the code to utilize the Google App Engine platform and other open source software stacks. We’ve made great progress in that regard and are quite confident that we’ll soon be able to hand over a working codebase to MIT. Then we’ll continue to work with engineers at MIT to get that code up and running on MIT controlled servers. We’ll also be helping them to ensure that the code can scale to support the expected level of App Inventor use. We anticipate these handover activities to take a few months. This means that it is very likely that there will be a period of time between when the current servers are shut down (i.e. December 31, 2011) and when the MIT servers are up and running at full scale. It is also likely that before the end of the year MIT will be able to make versions of the open-source code or libraries available to experienced App Engine developers in order to run their own App Inventor servers on App Engine for small scale groups. We also anticipate that MIT will open up test versions of the server before the full scale server is up and running. We at Google might also ask for your help in testing even earlier versions. As this handover proceeds and we have more test results we’ll continue to fill you in our progress and get more specific about plans and dates. 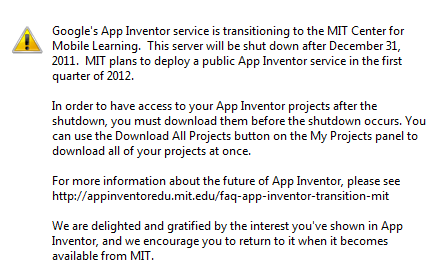 I’d also like to mention that we recently held an App Inventor Summit meeting on the MIT campus, where MIT, Google and representatives from some of our larger user organizations met for a day to discuss the handover and what we can do to help ensure the long-term future of App Inventor and its community of users. The meeting went very well and I’m hoping that some of the people who were there will post their take on the day’s activities. One of the outcomes of the meeting was that the MIT Center for Mobile Learning will soon start communicating its plans and will host some stories and information from the App Inventor educational user community. Thanks to all of you for your continued support of App Inventor. 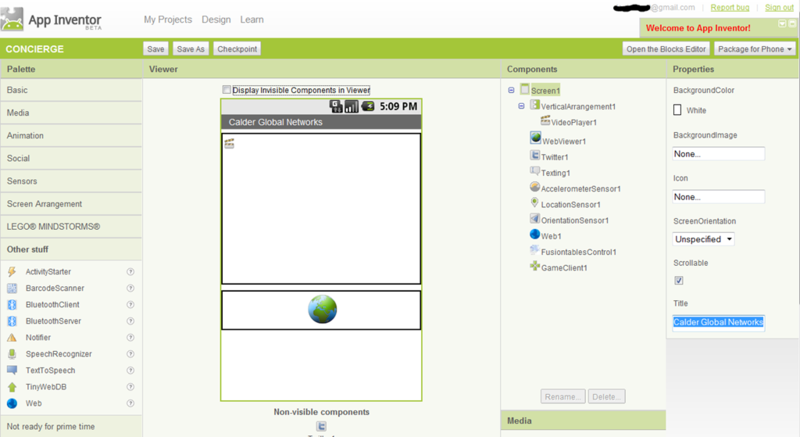 Your enthusiasm and feedback have inspired us through the first phase of App Inventor. We hope it will similarly inspire the next phase!